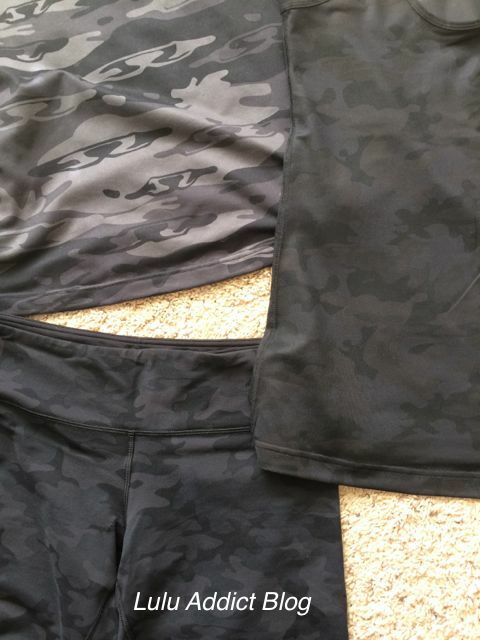 Black Retro Camo CRB on left vs. the new Black Savasana Camo on the right. The camo print in the new CRB is super, super subtle. (Note, I think it shows up better in these photos than it does in real life.) I find it too subtle for me so it's going back to the store. 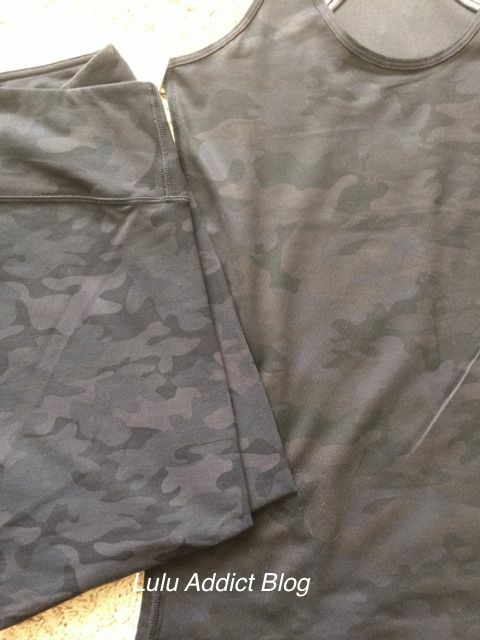 Showing how much the other camos show up better than the Black Savasana Camo CRB - Fatigue Savasana Camo CRB on the left, Black Savasana Camo in center, Retro Black Camo CRB on right, and black Savasana denim camo Wunder Under crops on the bottom. The print shows up better in the denim luon than the polyseter light luon used in the Cool Racerback. 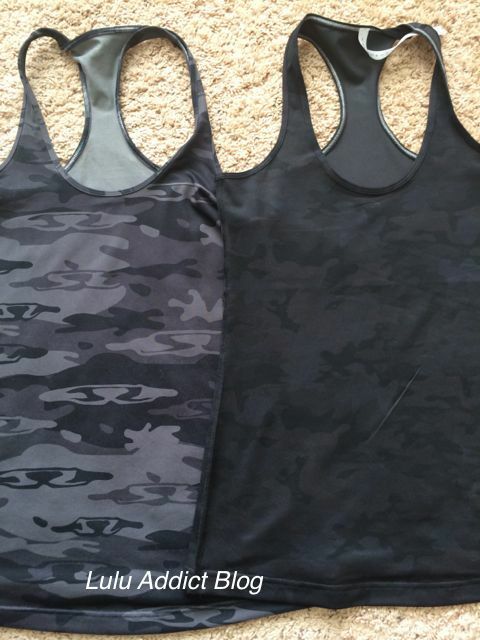 Savasana Camo WUCs on left and CRB on the right - the print shows up much better in the crops. Retro Camo CRB on top left, Savasana Camo CRB on right, and Savasana Camo WUCs on bottom. LLA, is the retro camo print available on any CRBs or WUC/WUP right now in stores? looking for that print... so great. @Lauren - the retro camo fabric is out in the Front Racer tank. That is the only item I've seen it in. I try to err on the subtle side of things - especially things like Lululemon clothing that are pricey. They last longer. I've learned my lesson with many trendy colours, prints, and patterns. After shelling out plenty of money, it's my solid black Lulu that stands the test of time. I know petite fleur and antidote are getting a big push now, but I predict that people's eyeballs are going to be worn out pretty soon. I returned my camo CRb as well. Way too subtle and shiny for me. I also got my black camo CRB this week. I agree it is subtle but I too will be keeping it. I like the silkiness of it compared to my other CRBs. I have the midnight iris print CRB and they are similar although I think the black camo is slightly thinner. I haven't had any problems with pilling on the midnight iris one so don't anticipate problems with this one. 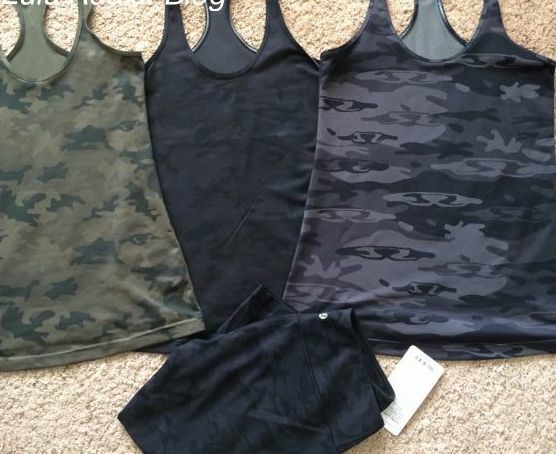 I also don't have a plain black CRB so the camo will work great in my growing lulu collection since I can wear it as a pattern or as a black tank. I also recently received my bali breeze CRB and that is the color I'm on the fence about! It is a beautiful color but I'm not sure it goes with my skin tone because it is so bright. Always interesting to see the comparisons. I returned my fatigue CRB for the black savasana one. I like that it's subtle and don't think it's too shiny. I do like the retro black camo and would buy that too if I had the chance. I know it's coming out in that front racer tank...I don't think that has hit my Canadian stores yet?